Greetings! I am happy to share with you some highlights of the past year and a brief preview of the year to come. This year we welcome Professor Sara Matthiesen, a specialist in U.S women’s history. Sara’s arrival fills a longstanding gap in the department’s research and teaching profile. Her exciting work on reproductive politics will be of great interest to professional scholars and students alike. This has been a banner year for faculty accomplishments. Four faculty members published major books to noteworthy acclaim. Tyler Anbinder’s City of Dreams: The 400-Year Epic History of Immigrant New York won the Mark Lynton History Prize, the New York Book Prize, and was named one of the New York Times’s 50 best non-fiction books. David J. Silverman’s Thundersticks: Firearms and the Violent Transformation of Native America received glowing reviews in the Los Angeles Times and the New York Times Book Review. This past spring saw the publication of Jenna Weissman Joselit’s Set in Stone: America’s Embrace of the Ten Commandments and Gregg Brazinksy’s Winning the Third World: Sino-American Rivalry during the Cold War. Finally, Andrew Zimmerman won prestigious fellowships from the Guggenheim Foundation, the ACLS, and the Institute for Advanced Study. The department hosted a highly successful symposium on “Citizenship and Subjecthood in Comparative Perspective” featuring renowned historian Frederick Cooper and an international panel of experts. Our students continue to do the department proud, sweeping the awards at the regional Phi Alpha Theta History Honors Society Conference. Looking forward, we have ambitious plans to connect our students to relevant job opportunities and rebuild our traditional strength in early modern European history. We greatly appreciate your continuing interest in the History Department. Your support has made a real impact on our research and on the experiences we are able to offer our students. If you are in the D.C. area, please stop by. We would love to see you at one of our events or in the hallways for a chat. Thank you again! Arie Dubnov Joins the Faculty! Prior to his arrival at GW, Professor Dubnov taught at Stanford University and the University of Haifa, Israel. In 2014 he was a participant in the National History Center’s International Decolonization Seminar, and in 2016 he was awarded the Dorset Fellowship at the Oxford Centre for Hebrew and Jewish Studies and was a Visiting Scholar at Wolfson College. Professor Dubnov is excited to be at GW and is honored to serve as the inaugural Max Ticktin Professor of Israel Studies. He hopes to use his position to expand the interest in Israeli history among GW students and faculty, based on a close intra-disciplinary and cross-disciplinary dialogue between modern Middle East history, Judaic studies, and the scholarship done on empire and decolonization at GW. The unique research resources in the greater D.C. area, combined with the intellectual enthusiasm of GW’s student population and their eagerness to impact positive growth on the world, provide him with more than one reason to be optimistic. Sara Matthiesen Joins the History Department! The History Department enthusiastically welcomes Sara Matthiesen to GW! She works on modern U.S. history, with an emphasis on gender, race, sexuality, and reproduction after 1945. Her current book, Reproduction Reconceived (forthcoming from the University of California Press), examines battles over the right to family-making since the 1970s. This project uncovers debates between grassroots activists and public institutions to define what conditions were necessary to make biological and social reproduction accessible to all, and how to distribute the costs required for such a project. Taken together, these battles demonstrate the process by which procreation was increasingly isolated from a politicized reproductive rights framework commonly associated with abortion and contraception, and instead conceived more narrowly as an individual choice. Based in archival research, oral histories, and digital cartography, this history helps makes sense of our contemporary cultural and structural reality that regards parenthood as a social privilege rather than a social right. Her work has been published in Signs: Journal of Women in Culture and Society, Feminist Review, and Women’s Review of Books. Her second book will examine the development of “battered woman syndrome.” With origins in the space between psychology, legal strategy, and victim rights lobbying, the syndrome helped to redefine crimes committed by women as self-defense against intimate violence. Professor Matthiesen brings these interests and her expertise to her teaching and advising in the History Department and Women’s, Gender, and Sexuality Studies Program at GW. Prior to her arrival at GW, Professor Matthiesen’s research on reproduction, inequality, and social change was recognized with a Presidential Diversity Postdoctoral Fellowship from Brown University. During her two-year term, she taught courses on the history of crime and sexuality in the United States and critical legal theory in the American Studies Department. In collaboration with Brown’s then-new Title IX Office, she also continued a project she began during her doctoral work which involved researching how universities across the country were leveraging Title IX protections in order to support graduate and medical students’ doctoral careers. Before leaving Brown, she used this research to develop an intersectional Title IX resource module tailored specifically to graduate and medical students that is now required education for all new enrollees. George Washington’s chapter of Phi Alpha Theta, the national history honor society, had a very active year in 2016-2017. Perhaps most impressive was its performance at the Mid-Atlantic Regional Conference, where GW students won three of the four prizes awarded—an unprecedented showing! Sam Pfister’s paper, “Monumental and Diplomatic: The Role of the Megiddo Great Temple in Egyptian Hegemony” won for Best Ancient History. Kate White’s paper about the university's namesake, “An American Icon Through the Ages: Depictions of George Washington in the Collection of the George Washington University Museum,” was the best paper on an American history topic before 1865 while Joe Albanese’s paper about “Bloody Mary” Tudor, “Cloths, Cracks, and Catholics: Mary I’s Consolidation of Power through Portraiture and Ceremonial,” won as best European history paper. The group did a lot of things besides write prize-winning papers. Anne Dobberteen (Phi Alpha Theta, class of 2010), offered a behind-the-scenes tour of the Albert H. Small Washingtonian Collection at the GW Museum. PAT conducted a very successful Internship Fair, with representatives from many institutions that employ GW students as interns, including the Wilson Center, National Park Service, AHA, Tudor Place, Civil War Trust, Anderson House, Dumbarton Oaks, and the Navy History and Heritage Command. Professor Schultheiss conducted an outstanding workshop on techniques for getting into graduate school. Chapter President Joe Albanese arranged for a ghost tour of Old Town Alexandria that promises to become a regular event. Professor Colin Calloway of Dartmouth College talked to the group about Native American history. Six of our members participated in a project to help the GW Museum reach out to students by helping to design an exhibition and writing labels for items to be displayed—it turns out to be tricky to convey the essence and importance of an artifact in just 50 words! They succeeded and their work will be displayed this fall. The society inducted 15 new members in the Fall and Spring Ceremonies, at which Professors Christopher Rollston and Hugh Agnew presented key note addresses. Oh, and PAT had very successful, hotly waged history trivia contests at its monthly meetings. Professor emeritus Peter Klaren and Dr. Sara Castro-Klaren were awarded the Decoration of the Order "El Sol del Perú" in the Degree of "Comendador," the highest honor bestowed by the government of Peru. In presenting the award, the ambassador of Peru, Carlos Pareja, cited Professor Klaren and Dr. Castro-Klaren's important contributions to scholarship on the history and literature of Peru, as well as their efforts to promote understanding about Peruvian culture in the United States. Joel Blecher's article, "Revision in the Manuscript Age: New Evidence of Early Versions of Ibn Ḥajar’s Fatḥ al-bārī," was the year’s most read article in the Journal of Near Eastern Studies. The essay documents a significant manuscript discovery that Professor Blecher made several summers ago. "It is extremely rare to come across early manuscript versions of a text of this stature in the Islamic tradition," he notes. "Imagine finding an early draft of Don Quixote, or better yet, an early version of Thomas Aquinas' Summa." Professor Blecher also published an article on the find, “A Newly Discovered Manuscript and Its Lesson on Islam,” in The Atlantic. Tom Long was awarded the 41st annual George Washington Award. In addition, he was selected as the faculty speaker at the May 2017 CCAS Commencement Exercises. Tyler Anbinder’s book, City of Dreams: The 400-year Epic History of Immigrant New York was awarded the Mark Lynton History Prize of the Columbia University School of Journalism. The books tells the story "of innovators and artists, revolutionaries and rioters, staggering deprivation and soaring triumphs, all playing out against the powerful backdrop of New York City, at once ever-changing and profoundly, permanently itself.” In addition, the book was also named one of the New York Times Book Review’s 100 Notable Books of 2016. Gregg Brazinsky published Winning the Third World: Sino-American Rivalry during the Cold War (University of North Carolina Press ), in which he explores how both the United States and China fought vigorously to establish their influence in newly independent African and Asian countries. Denver Brunsman has authored an e-book entitled Leading Change: Lessons in Leadership, vol. 4. George Washington and Establishing the Presidency. Diane Cline, won the 2016-2017 CCAS Columbian Prize for Teaching and Mentoring Undergraduate students. She also published The Greeks: An Illustrated History (National Geographic), which offers an account of the history, culture and belief systems of the Ancient Greeks and how their influence continues to be felt today. Jisoo Kim’s edited book The Great East Asian War and the Birth of the Korean Nation was published by Columbia University Press. David Silverman published Thundersticks: Firearms and the Violent Transformation of Native America (Harvard/Belknap). The book reframes our understanding of Indians’ historical relationship with guns, arguing against the notion that they prized these weapons more for the pyrotechnic terror guns inspired than for their efficiency as tools of war. Native peoples fully recognized the potential of firearms to assist them in their struggles against colonial forces, and mostly against one another. Jenna Weissman Joselit published Set in Stone, America’s Embrace of the Ten Commandments (Oxford University Press). The book traces how the Ten Commandments became the public face of the American Jewish community, internally through stained glass and externally through the deployment of large scale sculptural Decalogues, shedding light on American Jewry's bid for acceptance in the United States. Andrew Zimmerman won the John Simon Guggenheim Foundation Fellowship for his current book project, Conjuring Freedom: A Global History of the American Civil War. Professor Zimmerman writes: “Conjuring Freedom offers not only a new interpretation of the U.S. Civil War but also a model for rethinking archetypical national events like the U.S. Civil War from a perspective that is transnational, deprovincializing and ‘from below.’” In addition, Professor Zimmerman also won fellowships at both the American Council of Learned Societies and the Institute for Advanced Study. He also published an edited version of The Civil War in the United States. Jason Dencklau (MA student) has received a research travel grant from the Loeb Institute for Religious Freedom. He will use the grant to work in archives in Rhode Island to complete research for his thesis on northern Baptists in early America. PhD student Chelsea Davis presented a paper on "Protection or Paternalism? Understanding Amelioration and the Office of the Guardian of Slaves at the British Cape of Good Hope, 1826-1834" at the recent North American Conference on British Studies. PhD student Lauren Jannette recently presented a paper entitled "Manipulating History through Educational Texts: British and French Perspectives on the First World War" at the 66th annual New York State Association of European Scholars conference. PhD student Michael Johnson co-authored an essay with Villanova professor Joseph Lennon entitled, "A Digital Exploration of Hunger Strikes in British Prisons, 1913-1940," in The Digital Arts and Humanities: Neogeography, Social Media and Big Data Integrations and Applications. PhD candidate Ruby Johnson was awarded a 2017 Cosmos Scholar Grant to spend two weeks at the Mormon historical archives for her dissertation, tentatively entitled "Privatizing Welfare: Mormon Women and Utah's New Deal Alternative." PhD candidate Charles Kraus recently presented a paper at Cardiff University in the United Kingdom. The paper, entitled "Losing Asia: The Republic of China, the Chinese Civil War, and a Divided Region, 1945-1950," was part of a conference on The Chinese Civil War and the Cold War. PhD candidate Ryan Musto presented a paper entitled "The Limits to Desire: Latin America in India's Diplomatic Imagination, 1962-1972," at a conference on Latin America in a Global Context, hosted at the Fundação Getúlio Vargas in Rio de Janeiro, Brazil. He was awarded a Nuclear Security Fellowship at Fundação Getúlio Vargas in San Paulo, Brazil. In addition, he published an essay on “India and Flashpoints in Latin America’s Cold War” on the History and Public Policy blog of the Wilson Center. PhD candidate Alexa Price was awarded a Cosmos Club grant to pursue research for her dissertation on "Nostalgia, Heroism, and British Conceptions of the Historical Sailor at the Turn of the Nineteenth Century." PhD student Ashley Valanzola was selected to participate in the 2017 Auschwitz Jewish Fellows Program which featured a three-week trip to Poland. PhD Student Ben Young’s article, “The Reagan-Era invasion that drove North Korea to develop nuclear weapons,” was published by The Washington Post. In it, he explores how the United States’ invasion of Granada shaped North Korean fears of a U.S. led intervention. He also published “How North Korean magazines accidentally subverted the USSR” in The Guardian. PhD candidates Katharine White and Kate Densford were awarded CCAS Dean’s Teaching Fellowships for 2017-18. PhD student Nathan Wuertenberg received a Massachusetts Society of the Cincinnati Fellowship from The Society of the Cincinnati Library in D.C. The First Federal Congress Project completed the 22nd and final volume of its documentary history of the First Federal Congress of the United States of America. After 20 years of hard work, members of the project fulfilled their mission statement of collecting, digitizing, editing and publishing an account of nearly every written record pertaining to the First Congressional Session (1789-1791) of the then-newly formed federal government. The 15th Annual International Graduate Student Conference on the Cold War was held at GW. Doctoral students Milorad Lazic ("'Yugoslavia is Proud to be the First Socialist Country that has Supported Your Revolution': Yugoslav Military Aid to Ethiopia and Josip Tito's Attempts to Influence the Global Cold War, 1977-1979") and Gregory Graves ("Five Days in July: Tilting Toward Taksim in Cyprus") delivered presentations; Professor James Hershberg commented on one paper and gave a presentation on foreign archival research; and Gregory F. Domber, PhD ’08, chaired and commented. The conference is held annually with the venue rotating among GW, UC-Santa Barbara and the University of London. The department hosted a highly successful symposium on “Citizenship and Subjecthood in Comparative Perspective.” Organized by Professor Dina Khoury, the two-day event featured the eminent historian Frederick Cooper (NYU) as well as several panels of experts on the topic. Diana Alvarez Carrillo, BA ’15, is moving to Spain to study culinary tourism at the Basque Culinary Center in San Sebastian after two years working in the digital advertising industry in London. Peter Baxter, MA ’99, now serves as CEO of Airdyne Aerospace and Airdyne R&D after jetting away over long weekends from GW history and law studies to develop defense-related business worldwide for several companies. Jay Bender, BA ’78, has worked in construction management for 30 years. He has spent the past two years working as a paramedic. Neil Bhatiya, MA ’09, is the research associate for the Energy, Economics, and Security program at the Center for a New American Security, a Washington, D.C., think tank. Michael F. Bishop, MA ’94, is director of the National Churchill Library and Center at the George Washington University and executive director of the International Churchill Society. Richard Boles, PhD ’13, joined the history department at the Oklahoma State University in August 2016 as an assistant professor of early American history. Richard teaches undergraduate and graduate students and continues to research race relations in American churches. Jackie Burns, BA ’09, earned an MA and an MSc in international and world history from the dual master's degree program at Columbia University and the London School of Economics. Patrick Clevenger, BA ’08, is currently pursuing a dual MS/MBA degree at the University of Texas at Dallas after two years as an adventure guide followed by three years working for an environmental nonprofit. He enjoys playing bluegrass music with his girlfriend too. Shripal Daphtary, BA ’97, is a happy husband and father of two, living in Brooklyn, N.Y. He is the managing director of a telecom and technology company in NYC. Neil De Haan Jr., BA ’70, respect for history continues, and it has remained during his further educational pursuits, including one year of study in theology, and earning an MSW, MBA and PhD in public administration. His focus is now John Adams and politics since 1964. Corey Decker, MA ’13, is now an adjunct history instructor for Wallace Community College where she teaches U.S. and world history. She also teaches on the high school level including dual enrollment classes. She blogs about her teaching adventures at MsDeckersClass.com. Thomas DeLay, BA ’12, is currently serving as history department chair at KIPP Believe College Prep in New Orleans, La. He was a 2017 semi-finalist for the Fishman Price for Superlative Teaching Award through TNTP. Frank DeMarco, BA ’69, saw his 13th book, Awakening from the 3D World: How We Enter the Next Life, published in September by Rainbow Ridge Books. Ron Denham, BA ’67, devotes his retirement to reading (his latest is Tyler Anbinder's City of Dreams), writing a historical novel and traveling with his wife to Europe. Gregory Domber, PhD ’08, is now teaching history at California Polytechnic State University in San Luis Obispo along with two other GW grads, Joe Bassi, MA ’03, and Christina Firpo, BA ’00. Adam Drexler, BA ’05, serves in the U.S. Marine Corps, recently graduating from the Naval Postgraduate School with an MA in security studies (Europe and Eurasia) and awarded the Foreign Area Officer Association Award for Excellence in International Affairs. Alison Dundore, BA ’17, is back at GW getting her master's in speech language pathology. Joseph Enright, BA ’70, was hired at the American Revolution Bicentennial Commission in the summer of 1970 with his BA in history. After the agency's expiration, Joe continued a 35+ year federal career as an international trade specialist at the Commerce Department, through 2005. John Farkas, BA ’09, is currently working for the Diocese of Scranton as the manager of development and alumni relations for Catholic schools. Gabby Friedman, BA ’13, is living in D.C. and is a specialist of government affairs for Gap Inc., the parent company of Gap, Old Navy, Banana Republic, Athleta, Intermix and Weddington Way. Patrick Funiciello, PhD ’16, is an assistant professor of history at Tarleton State University in Stephenville, Texas. Felix Harcourt, MA ’09, PhD ’14, is a visiting assistant professor of history at Austin College. His book, Klu Klux Kulture: America and the Klan in the 1920s, will be published by University of Chicago Press in November 2017. Kate Hardwick, BA ’11, is starting her fifth year teaching high school history and humanities in Alexandria, Va. This past year Kate also earned her MEd from Vanderbilt University in independent school leadership. Andrew Hartman, PhD ’06, is a professor of history at Illinois State University. He recently signed a contract with the University of Chicago Press to publish his third book, Karl Marx in America. Jeff Hassmann, PhD ’02, is currently serving as professor of history and chair of the Social Sciences Division at Northeast Lakeview College in San Antonio, Texas. Brian Hines, BA ’13, is the general manager of Pearson's Wine and Spirits, a family owned and operated tradition in the Glover Park/Georgetown area since 1933. He proudly consults hundreds of clients for private events, corporate events and parties in Washington D.C.
Candice Shy Hooper, MA ’08, was awarded two national awards for her book, Lincoln's Generals' Wives, the Silver Benjamin Franklin Award in History from the Independent Book Publishers Association and the Bronze Medal in History from the Independent Publisher Book Awards. Shawn Hoyer, BA ’99, is now leading Bank of America Merrill Lynch's Growth Technology Banking practice for the Mid-Atlantic region, based in Washington, D.C.
Umar Husain, BA ’17, is working as a strategy consultant for IBM, based in Washington, D.C. Umar’s current project focuses on supporting a military client with talent engagement strategy. Don Insley, BA ’17, took a graduate degree in political science from Edinburgh University in 2012. Thereafter he went to work at NATO in The Hague and Norfolk for two years, now he's a senior consultant with Booz Allen in Los Angeles where he supports the Air Force on GPS. Sicheng Jiang, BA ’15, will graduate from Columbia University with an MS in enterprise risk management, and will start to work in Protiviti as a consultant. David Johnston, BA ’08, spent 24 years in the restaurant business and then 30 years in real estate. He specializes in selling historic properties. Stephen Judge, BA ’57, MA ’60, has retired from a marketing and editorial career with Oxford University Press. Edward Kemper, BA ’65, went to GW Law School after graduating with a history degree, and when he graduated took a job offer in Honolulu. He has practiced law in Honolulu ever since. Dan LeClair, BA ’05, is serving as director of development for the global environmental nonprofit, 1% for the Planet. Francis Letro, BA ’72, obtained a law degree JD from SUNY Buffalo and has been practicing law as a sole practitioner since 1980 in Buffalo N.Y. Francis is currently the president-elect of the NYS Academy of Trial Lawyers and the immediate past chair of the University at Buffalo Foundation. Hui Lin, MA ’14, is teaching at WLSA Fudan Academy, Shanghai, China. Cynthia Little, BA ’67, is the historian for the Philadelphia History Museum overseeing the Community History Gallery and exhibition development. She also heads up youth education and teacher training programs. Juli Loyd, BA ’04, is an attorney practicing health regulatory law in-house at DaVita, Inc. in Denver, Colorado. She is married to a data scientist with whom she has a practice baby—a shelter pup she adopted while still living in D.C., named Oskar Blues. Edward J. Marolda, PhD ’90, was recently named by the U.S. Naval Historical Foundation as a recipient of the prestigious Commodore Dudley W. Knox Naval History Lifetime Achievement Award for his 37 years with the Navy's historical program and authorship of 15 books. Sarah Maserang, BA ’15, spent a year after graduation working with kids before she moved to North Carolina where she is in her second year at UNC School of Law. She spent her summer working for a public defender and is studying education law and child advocacy. Chris Mason, PhD ’13, is a professor of national security affairs at the U.S. Army War College in Carlisle, Penn. Melia Mbanefo, BA ’16, graduated with a major in sociology and minors in history and communications in May 2016. She is currently enrolled in the Valparaiso University Law School hoping to practice civil rights law or family law upon graduation. Christel McDonald, BA ’86, is living very much in the present and look into the past through historical research to find the root causes of personal, local, regional, national and international conflicts to build a better future—everywhere and anytime. Christel lives in Arlington, Va.
Darren Menaker, BA ’00, lives in L.A. with his wife and toddler son. Darren is a principal at Bernstein Private Wealth Management providing investment guidance for high net worth individuals, families and institutions. Currently he chairs GW’s L.A.-regional alumni network. Gabriel Muller, BA ’13, works for The Atlantic magazine's digital consultancy, where he runs large-scale editorial projects for nonprofits and Fortune 100s. He also works as a freelance writing coach for writers aged 15 to 80. Christopher Murry Jr., BA ’09, lives in Maine working for MaineHealth. He was recently invited by the Epic Systems Corporation to give a talk on the cultural considerations required in implementing a new perioperative coordination process. Anthony Narcisso, BA ’83, was known to add a splash of levity and rapier repartee during history seminars. He wonders to this day if those incidents affected his grade. John Newman, PhD ’92, published his dissertation as the eminent book JFK and Vietnam. John served in Army intelligence as military assistant to the director of NSA. He teaches counterterrorism at James Madison University, and is finishing his fourth volume on JFK's presidency. David Oliver, BA ’98, is a CPA and runs his own practice in Manhattan Beach, Calif. David and his wife, Sonya, have two sons, Jonah (7) and Zachary (5). Michele F. Pacifico, MA ’83, was inducted in July as a Fellow of the Society of American Archivists (SAA). The distinction of Fellow is the highest honor bestowed on individuals by SAA and is awarded for outstanding contributions to the archives profession. Owen Pagano, BA ’14, is currently a project manager at Dimensional Fund Advisors in Austin, Texas. John Patton, BA ’69, graduated from GW Law in 1974. He currently lives in D.C., retired from the IRS charitable organizations section. He would like to see a history review course similar to the Law Bar and CPA Exams that he passed. Nicole Phelps, BA ’00, contributed a chapter on “Expansion and Diplomacy, 1865-1914" to the annotated bibliography The SHAFR Guide and won the College of Arts & Sciences Faculty Distinguished Service Award at the University of Vermont. Leslie Pitterson, BA ’09, was promoted to vice president of communications for US Media at Nielsen. In this role, she oversees integrated campaigns and media relations supporting the company's digital shift, including its digital products and clients. Curtis Raye, BA ’07, is running for New Jersey State Apiarist, however the position is hired, not elected, so he is not on any ballot and nobody seems to even know he's doing it. Please visit curtis4bees.com. Clifford Rees, BA ’74, is the proud legacy parent of Alice Rees, who enrolled as a first year at GW’s Columbian College of Arts and Sciences starting in the fall of 2017. Michael Rhode, BA ’87, has worked in military medical history since graduating and is currently the archivist with the Navy's Bureau of Medicine and Surgery's History Office. His most recent book is 2017's The Incomplete Art of Why Things Are about Richard Thompson. Kate Rosenberg, BA ’08, is currently serving as the Combat Systems Officer in USS Donald Cook (DDG 75), homeported in Rota, Spain. Steven Ross, BA ’70, is currently a counselor for the Kingman, Arizona Elementary school district. Arnold Rudin, BA ’55, has written or edited 17 books. His latest book, Pillar of Fire: A Biography of Rabbi Stephen S. Wise (Texas Tech University Press) was nominated for the 2016 Pulitzer Prize. Philip Runfola, BA ’64, continued to work as an independent contractor for an additional 10 years after retiring from the CIA after 35 years of service. Philip is now retired in Florida and golf occupies the majority of his time. Bruce Rushing, BA ’09, started a PhD program in logic and philosophy of science at the University of California, Irvine. Pauline Schwartz, BA ’02, started her own company, Briden Chase, where she matches financial services compliance professionals with career advancing opportunities. She is also the third vice president of the Dix Hills Jewish Center. Raabia Shafi, MA ’08, debuted her boutique consulting firm in January 2017. With over 10 years of experience in human-centered design and adult learning strategies Raabia will help executive leadership teams across all industries transform their organizational cultures. Shayna Sloan, BA ’16, is currently working as an interpreter in Military Programs at Colonial Williamsburg. She is an interpreter at the axe throwing range and is occasionally part of the gun crew that fires a reproduction 18th century light three-pound cannon. Barry Spiegel, BA ’65, has just retired as chief human resources officer from Cornerstone Montgomery, a non-profit agency providing services to the mentally ill.
Daniel Sullivan, BA ’83, celebrated his 30th anniversary at the law firm of Robinson & Cole, which he joined following graduation from The National Law Center in 1987. He practices in the firm's Providence office, which he co-founded in 2009. Malcolm Surer, BA ’15, is currently a journalist in Beijing and a master’s student in IR at Peking University. William A. Taylor, PhD ’10, is an associate professor at Angelo State University. He is the author of Military Service and American Democracy (University of Kansas Press, 2016) and Every Citizen a Soldier (Texas A&M University Press, 2014). Margaret Walrod, BA ’12, is working as a program analyst for the U.S. State Department in the Bureau of International Information Programs. This summer she completed a certificate in International Crisis and Conflict Negotiation from the University of Washington. Art Weber, BA ’73, retired as a colonel in the USMC. He is currently an adjunct professor at the Naval War College. He has been teaching a seminar on the Vietnam War for the past 20 years. Dan Whittier, BA ’11, is currently working as a consultant in the Telecommunications Practice at Kaiser Associates in Washington, D.C. As a consultant, he assists clients in operational process improvement, focusing on the South America market. Steve Willenbucher, BA ’00, is living in Alexandria, Va., with his wife and two children. Steve is currently the director of contracts with SBG Technology Solutions, Inc., an Alexandria-based Government IT, engineering, and consulting firm. Chance Williams, BA ’16, is starting an Erasmus Mundus European Master's Program on “Dynamics of Cultural Landscapes and Heritage Management” this fall. He will spend the next four semesters studying in France, Portugal and Italy. Tsing Yuan, BA ’60, MA ’62, is now retired, having taught at Swarthmore and Wright State University, where he also served as History Department chairman. Tsing is living in the Princeton area, taking advantage of the Princeton History Department's speakers and special events. The Department of History would like to gratefully acknowledge the following generous donors who made a gift to the department from July 1, 2016 – June 30, 2017. Gifts to the Department of History allow us to provide support for faculty and student research and travel, graduate student fellowships, and academic enrichment activities including guest speakers, visiting faculty, and symposia. Each gift, no matter how large or small, makes a positive impact on our educational mission and furthers our standing as one of the nation's preeminent liberal arts colleges at one of the world's preeminent universities. By phone by calling the GW Division of Development and Alumni Relations at 1-800-789-2611. Connect with alumni in your industry through both virtual and in-person networking programs. Get involved with several opportunities from mentoring students to engaging with fellow alumni. 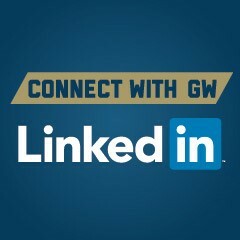 Connect with the larger GW and CCAS community through LinkedIn!